Win this app July 2-5, 2015! 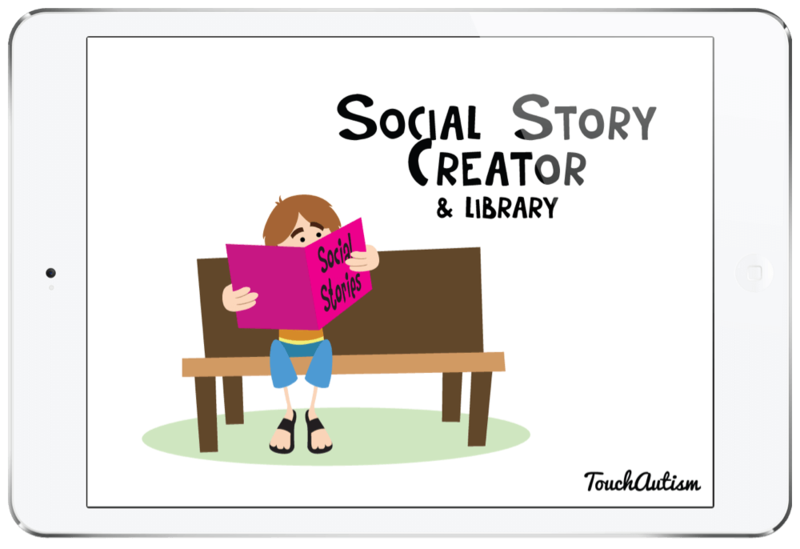 I am very excited to be reviewing the Social Story Creator & Library app today. This app was created right here at Touch Autism and is a free app! There are in-app purchases and upgrades available but the free version still packs a pretty strong punch and allows you to test the app out fully. Many of you who have tried this app before will be even more impressed with the new updates that are being released today. For those who are not familiar with social stories, they are short stories that break down an event or behavior into smaller and simplified steps. They discuss the relevant social cues and help the individual through whatever the situation may be. They were created for children with Autism to improve social skills. Since many children with Autism are visual learners, the stories are often accompanied with specific and clear pictures describing the steps. These stories have helped my son so much. We have personally created social stories for family weddings that he had to attend, vacations we were going on, specific behaviors that he was struggling with, and changes that our family was experiencing. The stories have been a tremendous help in overcoming anxiety, dealing with change, and stepping through certain life skills. We have also created picture schedules through this app. I can tell you plain and simple, I have not found an easier way than through the Social Story Creator app. Let’s get started! Touch Autism has listened to the feedback received and they have made this app even better. 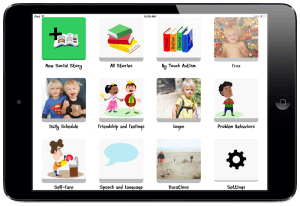 New features that have just been introduced include: organizing stories by category or by the child’s name, sharing the stories with others, printing the stories, and also purchasing the pre-made social stories written by Touch Autism in bulk for a 50% off discount. To share your stories, you will simply click on the story and then there is a yellow button below that says “Share and Print”. It will take you through the sharing process step-by-step. Another exciting feature is that you can add your own categories. Organizing the stories has never been easier. You can organize them by child if you are a therapist or have multiple children, or maybe by skill. Touch Autism has written and illustrated 10 new social stories available for purchase. They now have a total of 22 paid stories available. There is one story available for free so that users can see if they like the Touch Autism story format before purchasing any stories. The free story is about how to take care of a device like an iPad or iPod touch. Other story topics include: Asking to Play, Toilet Training, Divorce, Taking Turns, Learning to Wait, Using Money, and much much more. You can purchase any of them individually or you can purchase them all at once. When you choose a Pro Upgrade, you will also be able to print the stories in pdf format. All of the upgrades are available at any time in the settings menu. When you open the app, you will see pre-made categories with all of Touch Autism stories available. You will also see a square in the top left corner that says, “New Social Story”. Once you click on it, you can add the title and cover image. You will then be able to create one page at a time. You can add pictures, text, and record your own voice for each page. If you need a break, just press “Save and Exit”. You can come back at any time and edit it as much as you want. The child will watch the story and click on the screen to turn the page. After you have tested out this app and have seen how well it works for your family or clients, you can choose to upgrade with the in-app purchases.There are multiple options available when upgrading. The screenshot displayed to the right is found in the app’s settings menu for reference. It breaks down the differences pretty well. 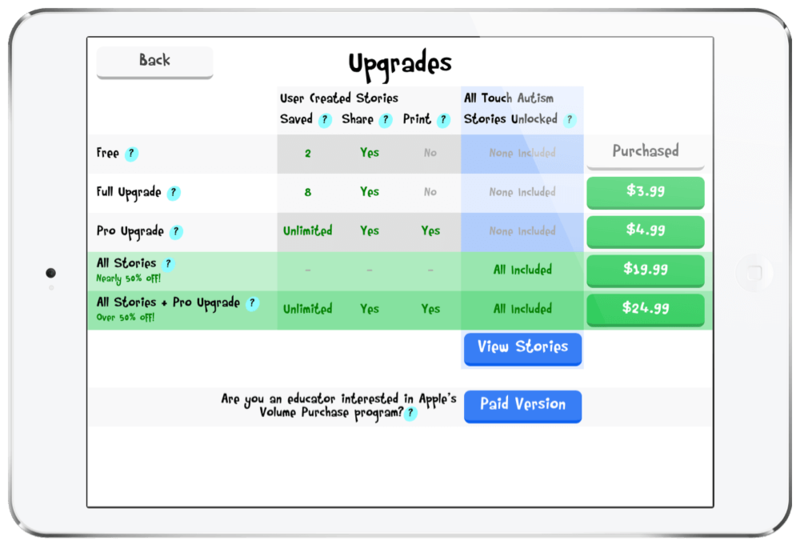 If you are an educator that needs the entire app unlocked to use school funds, or apple’s volume pricing, there is a Pro upgrade version available with all 22 stories unlocked. You can purchase it by clicking here. I am very excited about the new updates for this app. Writing and organizing social stories has never been easier than with the Social Story Creator & Library app. Whether you are purchasing the free version, upgrading to the Full of Pro option, or purchasing Touch Autism social stories separately, this app will be a huge help. 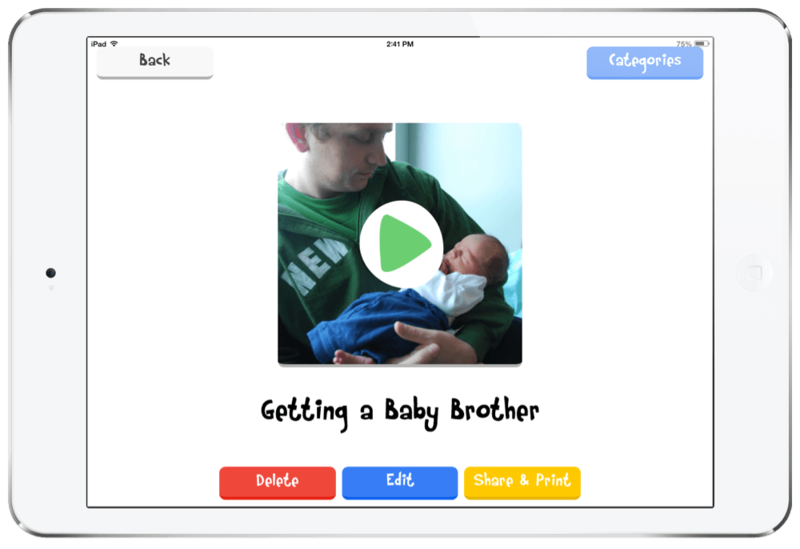 I love that the free version offers all of the great features that the pro-version has except printing so that you can fully try out the app with your clients or child before choosing to purchase any additional needs. Most other free version apps are lite versions that don’t offer all of the great features to try out. I also think that teachers and therapists will appreciate the option to categorize all of the stories. This app benefits all kids and adults that struggle with Autism Spectrum Disorders, Anxiety Disorders, Attention Deficit Disorders, or Speech Delays. One small improvement I would still love to see in the future is the ability to not let the child click through the story and make the story auto-play instead. My son gets a little too excited and clicks the screen too much which automatically turns the page. Overall, this is a brilliant app that so many kids, parents, teachers, and therapists will appreciate! Be sure to try this app out for yourself and like the Touch Autism Facebook page for weekly app giveaways. Touch Autism is dedicated to making the best apps for kids with autism, Down syndrome and other special needs. 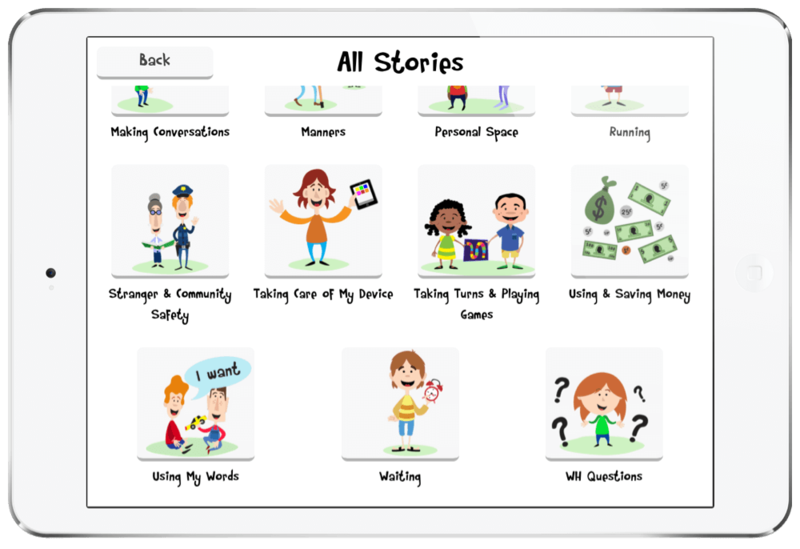 A Free app for creating, organizing, sharing, and printing social stories and visual schedules.